The cornea and sclera make up the outer tunic of the eye. Each is a connective tissue containing collagen fibrils embedded in a proteoglycan-rich extrafibrillar matrix, but whereas the cornea is uniquely transparent, the sclera is totally opaque. Both tissues require strength to maintain the excess pressure within the eye and to resist external knocks and the forces applied by the extraocular muscles during eye movement. This mechanical strength is provided by the deposition of collagen in a lamellar structure, where the lamellae run parallel to the surface of the tissue rather than through its thickness. The cornea is the main refractive element in the eye’s optical system, and it transmits over 90% of the incident light at visible wavelengths. Transparency is achieved because, at the nanoscopic level, the corneal collagen fibrils within the lamellae have a small, uniform diameter and are positioned with respect to each other with a high degree of lateral order. This exquisite arrangement causes destructive interference of scattered light and constructive interference of directly transmitted light throughout the visible wavelengths. As a lens, the cornea also has to be precisely curved, almost spherical near the visual axis but flattening in the periphery. Although the basis of this contour is not fully understood, corneal shape is likely achieved by the arrangement of the collagen at the microscopic level, and it is therefore not surprising that the lamellae have different preferential orientations centrally and peripherally. The sclera (the white part of the eye) constitutes the rest of the globe. It is a tough connective tissue and is continuous with the cornea. Scleral collagen is, in composition and arrangement, more similar to that seen in skin, with wider fibrils and a much more interwoven structure than cornea. It has no optical role other than to provide a support for the retina on the back of the eye but has important physiological functions (it contains fluid outflow channels to prevent excessive pressure within the eye) and mechanical functions (it maintains eye shape during ocular movement). 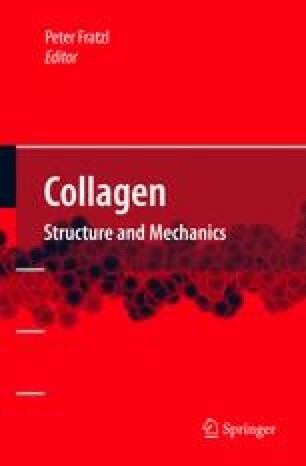 This chapter describes the structure of the corneal stroma from the macroscopic level to the nanoscopic level and focuses on the role of collagen in determining the mechanical and optical properties of this fascinating connective tissue. The chapter ends with a section describing the sclera and what is currently known about the changes in collagen that accompany the development of shortsightedness (myopia).